CHASSIS: Stability and control are the foundations of riding fun. With its ultra-lightweight tubular trellis frame, a high strength, die-cast, open-lattice swingarm and top quality components from WP Suspension, the KTM 1290 SUPER ADVENTURE S will cement a grin on your face. Keeping asphalt lovers in mind, the 1290 S is fitted with a 19 in. wheel up front; 17 in. at the rear. Quality tires and proper suspension travel push its cornering skills to the next level and brakes from world-renowned market leader Brembo, coupled with assistance systems (MSC with MTC and lean-sensitive C-ABS) developed in close collaboration with Bosch, round off the package. Safe. Fun. Fast. Everywhere. FRAME: The chrome-molybdenum steel trellis frame makes a major contribution to the bike’s excellent chassis geometry. It’s a rugged, laser-cut, robot-welded thing of beauty with a glorious surface finish. And at only 9.8 kg, it helps to keep the total, unfueled weight at a spectacular 215 kg. All muscle, zero fat. WHEELS: Tubeless allroad tires fitted on alloy rims, manufactured in a low-pressure die casting process. Not only do these featherweight wheels make the bike lighter overall, they also minimize the unsprung masses and moment of inertia, with a positive impact on handling and ride dynamics. The KTM 1290 SUPER ADVENTURE S gets a set of extremely grippy and durable Pirelli Scorpion Trail II’s sized at 120/70 ZR 19 and 170/60 ZR 17. They are the perfect wingmen for this corner stormer. SEMI-ACTIVE SUSPENSION: The innovative WP semi-active suspension system introduces a new level of focus and safety in motorcycle riding. The rider can select four spectrums of use: ‘Comfort’, ‘Street’, ‘Sport’ and ‘Offroad’ while the SCU (Suspension Control Unit) adapts the damping rates in real-time to the riding surface and rider, based on the information provided by a set of stroke sensors and accelerometers. In addition, the spring preload of the rear suspension can be set to four pre-defined settings (solo, solo with luggage, two-up and two-up with luggage) – providing the perfect geometry in all situations. The result: road-hugging handling all the way. STEERING DAMPER: With so much propulsive power, the front wheel can become very light, which can lead to unpleasant kick-back on uneven roads. The KTM 1290 SUPER ADVENTURE S prevents this with a subtle WP steering damper that will be there when you need it. FUEL TANK: The KTM 1290 SUPER ADVENTURE S is not only light, powerful and dependable; thanks to low fuel consumption, a 23-liter fuel tank and 15,000 km service intervals it also hardly ever needs to take a break. ENGINE: Based on the 1,301 cc V-twin of the KTM 1290 SUPER DUKE R, aka “The Beast”, the KTM 1290 SUPER ADVENTURE R is clearly the Alpha in its segment. ENGINE: The engine packs one hell of a punch for fully loaded tours, has truckloads of torque from the bottom up and hardly ever needs hurried downshifts. Therefore, the 1290 S is equally happy cruising around town as it is giving Superbikes a run for their money when the chips are down. With 160 hp and 140 Nm of torque on tap, of which 108 Nm is already available at 2,500 rpm, we wouldn’t bet against it. POWER-TO-WEIGHT-RATIO: The combination of lightweight chassis engineering and a compact but powerful engine take the KTM 1290 SUPER ADVENTURE S to the top of its class in terms of power-to-weight ratio and ride dynamics. This fully equipped adventure bike tips the scale at 238 kg, while carrying a substantial 23 liters of fuel. 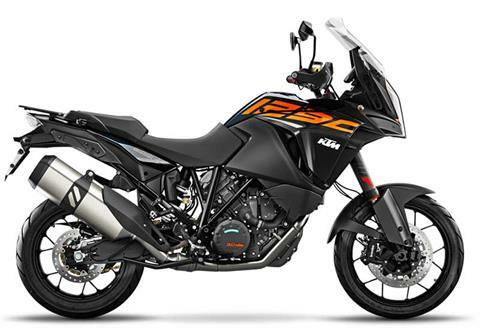 This makes the KTM 1290 SUPER ADVENTURE S – in typical KTM style – one of the lightest motorcycles in its segment. Add an outstanding geometry, well-balanced stiffness distribution and high quality suspension components and you end up with a bike that’s ready for anything. This also boosts safety, since it is far easier to fling a nimble motorcycle around a source of danger than a heavy one. ERGONOMICS: At KTM, individualists are welcome. The bike’s ergonomics can be adjusted to suit the preferences and stature of any rider, wherever they may roam: Two seat positions (860 mm or 875 mm), two handlebar clamping positions: horizontal +/- 10 mm, two footpeg positions: 10 mm up and back (diagonally), hand levers with 5 reach settings. SEATS: Thanks to KTM’s state-of-the-art 3D foam padding, the two-piece seat of the KTM 1290 SUPER ADVENTURE S has your back. No matter if you ride it to the local shops or the ones across the Alps, both rider and passenger will get there in comfort. On top, you can choose between two seat positions (860 mm or 875 mm). SOFTWARE: Sheer power under full control with the manners of a beast are made possible by the smoothly operating software and electronics. MTC, Cornering ABS and ride modes support your riding gently and almost imperceptible. The only intervention you notice is the smile on your face. KTM MY RIDE: New Turn-by-turn Navigation with KTM MY RIDE Navigation. For the navigation use case the rider needs to download the new KTM MY RIDE app (available from January 2018 for Android and iOS, surcharges may apply). The app transmits the turn-by-turn directions, the distance to the next turn, the street name and the arrival time/distance to the destination via Bluetooth to the dashboard of the motorcycle. In addition, audio guidance in various languages and offline maps are also available. KTM MY RIDE features navigation, accepting incoming phone calls and controlling your phone’s audio player. Available from January 2018 for MY18 1290 SUPER ADVENTURE S and R (also including production dates prior to January 2018) and retrofitable to MY17 1290 SUPER ADVENTURE S and R.